Residents call it “the neighborhood within a forest.” For the most part it’s a hidden retreat within the heart of the city, 240 acres east and south of the Hilldale Shopping Center, largely filled with winding roads, rolling hills and occasional architectural wonders beneath a dense oak canopy. It’s the greater Hoyt Park area on Madison’s near west side, and residents make it sound idyllic. Downing and his wife, Tammy, co-director of the dental hygiene program at Madison College, have lived at 3901 Priscilla Lane for nine years. Their mid-century modern home was designed by two associates of Frank Lloyd Wright, Herb Fritz and Herb DeLevie, and built in 1967-68. “Tammy and I both coveted this house as single people 15 years ago, which is weird,” he says. The couple bought it from the original owner. Their portion of the neighborhood is called Sunset Hills, and it features a dense collection of modern homes built with natural materials. When the land was developed in the 1950s, there were a number of unusual deed restrictions. “All of the houses had to be architecturally designed, and no two adjacent lots could be designed and developed by the same architect,” says Downing. Preservation of wooded and hilly topography and contemporary architecture were other requirements. So pleased has the family been that they’ve since bought a neighboring home planned by Lyle E. Nestingen, at 3905 Priscilla, which they rent out. Nearby lives Mayor Paul Soglin and his wife, Sara. She grew up in the area, “on the other side of the park, and always loved the houses in and around the park,” the mayor recalls. But until around a decade ago, Paul and Sara lived elsewhere. Two parallel city planning efforts are under way to ensure that the Hoyt Park area stays the way residents want it. Just how to do that, however, is a matter for future discussion: Portions could become local and even national historic districts. The city’s Department of Planning and Community and Economic Development has been working on two different projects. The Hoyt Park Area Joint Neighborhood Plan is tentatively scheduled to be introduced to the Common Council on April 30. It largely considers recommendations for public transport, possible street improvements and future development, mostly on the periphery. Meanwhile, the department has separately been working to create a survey of the area’s historic assets. Consultant Tim Heggland’s draft report was filed March 15, though preliminary findings were shared in December. “From this architectural survey, the consultant found five potentially eligible historic districts [within the Hoyt Park area] and two dozen individual properties that would potentially be eligible for listing on the National Register of Historic Places,” says Scanlon. Individual owners can consider pursuing local landmark status. Though it’s much too early to even think about it, Scanlon warns, it’s conceivable that both local and national historic districts could also be created, like Mansion Hill downtown. “Speaking for my wife and myself, we’re hoping that that certainly is the case,” says Downing. But that already makes some residents nervous. “I think that most of what people are worried about is that if they want to change their windows or something, the restrictions might be a little bit too heavy,” he says. For planning purposes, the city’s official boundaries for the Hoyt Park area are Midvale Boulevard, Speedway and Mineral Point Roads, and University and North Franklin Avenues. While the district is framed by some of Madison’s busiest thoroughfares, its often-narrow internal streets are not generally on the way to anywhere themselves. The sense of seclusion is aided by a “rural” lack of sidewalks in many spots, as well as the natural landscape. Besides Sunset Hills, the Hoyt Park area includes all or portions of the Rocky Bluff, Sunset Village, Radio Park and Hilldale Row Condominium neighborhoods, as well as “VanChaMasShe” – a portmanteau of Van Hise Avenue, Chamberlain Avenue, Mason Street and Shepard Terrace. According to planning documents and the 2010 U.S. Census, 3,557 people live in the Hoyt Park area. More than 75% of them have bachelor’s degrees or better, compared to 51% for the city. The city’s median age is just shy of 30. In the Hoyt Park area it’s 37.3; more than a quarter of Hoyt residents are 65 or older. The average Hoyt Park area home is assessed at $260,477. Housing styles across the individual neighborhoods are diverse, ranging from Queen Anne and Craftsman to Wright-inspired, International, ranch and even Lustron: prefabricated post-World War II homes made completely of steel. Despite different approaches and eras of development, edges tend to blur. 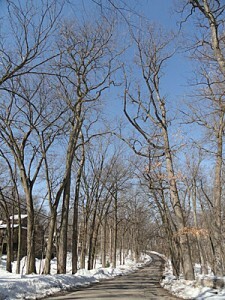 All the neighborhoods are tied together by the forested 24.01-acre Hoyt Park. In some ways, however, the Hoyt Park area is not unique at all. In fact, pieces of the park can be found all across the city and University of Wisconsin-Madison campus – literally. For the full story of the Hoyt neighborhood, we have to rely upon written histories, historic newspaper clippings, UW archives and Robert Dott Jr., UW emeritus professor of geology. He’s collected a wealth of resources that outline the area’s earliest development. Far from being new, it turns out that Hoyt is as old as Madison. We incorporated as a city in 1856. Way, way out in the country, what would become Hoyt Park was already hard at work as a quarry, sending its fine sandstone downtown for many early buildings. The entire area was, in fact, riddled with quarries. Frederick Paunack soon added another quarry near Bluff Street. In 1890 the city established its own quarry below now-defunct Hoyt School, skimming off the surface layer of dolomite for road construction materials. In 1895 Paunack and his son Edward opened yet another quarry on today’s Durose Terrace, immediately next to Hoyt. The entire street is reclaimed from the site, and Dott built a home there with his wife, Nancy, in 1965. “We had the quarry face in our backyard,” he recalls. “It was a marvelous place for a geologist’s family.” They departed only last year. Nearby a street is named for the owner of still another quarry, today the site of Quarry Park, 3102 Stevens St., which features hiking opportunities and a leashed dog area. All the stone removal made for rugged features that overgrowth has made attractive. The quarries eventually closed, and in 1935 the city’s land became the core of Hoyt Park, 3902 Regent St. and 3201 Bluff St.; it was later added to. Today the grounds include trails, a basketball court and softball field. The park’s own stone was used for construction of the front gate and other structures, including fireplaces and a shelter, a longtime favorite for weddings and reunions. They were built by Italian masons from the Greenbush neighborhood for the Works Progress Administration. According to neighborhood legend, the workers so loved their creations that when money for the project ran out, they continued for free. But the park’s future was made earlier, on an extension of Regent Street, when the entire area was still rough countryside. Edward T. Owen (1850-1913) was a New Englander who came to the UW to become a professor of Romance languages. He was eccentric and a lifelong collector of butterflies. He was known for his handlebar mustachios, huge car, massive bay horse, white suits, immense height and tiny wife. He was also well known for his fear of sudden Midwestern tornadoes. So that he could escape quickly, his State Street home, just west of today’s Urban Outfitters, featured a slide that led from his first floor study to a stone storm cellar. Owen was also wealthy, a lover of beauty, and one of the organizers of the Madison Park and Pleasure Drive Association in 1892, with his friend Frank Hoyt, for whom the park was named. Using private funds, the association eventually added Tenney and Brittingham parks to the city, besides much of Vilas Park and many other areas. That same year Owen purchased and donated to the city one of his favorite country riding trails, now known as Owen Parkway, a winding offshoot of Regent and the southern side of Hoyt Park. It features a stunning overlook, Sunset Point, which no longer looks steeply out over a pastoral setting but at Hilldale and Shorewood Hills. The drive was paved in 1910 and became the kernel from which Hoyt Park and the rest of the area grew. The Sunset Hills and Sunset Village neighborhoods are named after the point. It’s perhaps apocryphal, but one story has it that Hoyt Park would have been named for Owen, except that city fathers feared it would be confused with Olin Park. Housing development came slowly, and depended on improved transit. Streetcars’ last stop was the corner of Regent and Highland Avenue, near today’s West High School. Beyond the cemeteries there was little else. After automobiles came into widespread use, development was arrested by the Depression. Homes began to be built in Sunset Village just before World War II, but materials shortages further stalled construction. After the war, however, began the major and often innovative development plans, including what for many years was the only major business in the heart of the Hoyt neighborhood: WIBA radio. In 1948 the 23-year-old station moved from downtown to its new park-like facility, suitably named Radio Park, 3800 Regent St., not far from the Hoyt Park entrance. In 1953 it originated the city’s first stereo broadcast, though you had to tune in both its AM and FM services on separate radios to get the effect. The station left for Fish Hatchery Road in 1975, but its presence is recalled by the Radio Park Neighborhood Association and by the nearby 3.89-acre Reservoir Park, 126 Glenway St. Besides serving as part of the water utility since 1928, the park still boasts a radio tower – long the subject of various dares on the part of neighborhood children. “We look at the radio tower, but nobody plays on the radio tower,” reassures Downing. The park includes a basketball court and playground. Meanwhile, Prof. Owen’s selfless preservation of natural areas has been reinvented by the Friends of Hoyt Park, which incorporated as a nonprofit in 1995 to address conditions like the deterioration of the 1930s WPA improvements. Besides its ongoing activities, which have since expanded to include nature walks and improvement of drainage, for around a decade the organization has raised sufficient funds to host another very special neighborhood asset. “We are the only parks group in town that has its own ranger, as far as I know,” says John Elliot, chair of the Friends. The organization’s rangers have worked over the years to educate and lead volunteers and remove invasive plant species. The group works closely with the City of Madison Parks Division. Last year, the city replaced invasives removed by the Friends with more than 2,500 native plants. Meanwhile, she says, the city’s historic survey consultant has already strongly advised the city to pursue National Register status for Hoyt Park itself, which is already a city landmark. © Copyright 2014 Rocky Bluff Neighborhood Association. All Rights Reserved.